At just 16 miles per hour, it's safe to say Uber Eats courier Jesus Cassiano has one of the fastest delivery times in Miami. NBC 6's Laura Rodriguez reports. At just 16 miles per hour, it's safe to say Uber Eats courier Jesus Cassiano has one of the fastest delivery times in Miami, Florida. 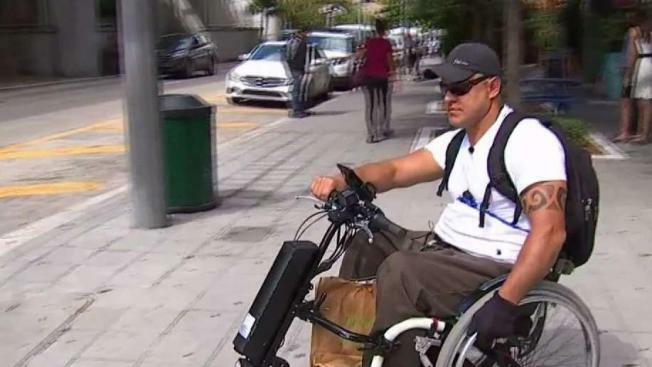 He beats the downtown traffic on his retrofitted wheelchair and takes pride in his ability to get customers their food – fast and fresh. "Hot and fast. It's important," Jesus said. "I love the face of the customers." At age 18, Jesus was in a car accident in Brazil that led to paraplegia and the need to adapt to life in a wheelchair. Upon arriving in the United States, he knew without a doubt he had to work – not just for the money, but also for his mind. "I love the life … my life," he said. "I love to work and the freedom." "Uber allows people and allows courier partners to really get access to making money in a way that maybe they wouldn't have been able to otherwise," said Rachael Jaye, General Manager of Uber Eats. Uber Eats requires couriers to have a smartphone, a bike or a motorized mode of transportation. So Jesus' ingenuity kicked in – and he modified his wheelchair and added an electric motor to it. "I have my mind. I have two hands," Jesus said. "Thank the Lord. There's opportunity, and when opportunity comes, you take it and go on." Jesus usually delivers within a four-mile radius and focuses on the Brickell, Downtown and Little Havana areas. His peak time is lunch. And Jesus has an impressive track record – he has done over 1,200 delivers and has a 5.0 rating. "So it's actually pretty impressive," Jaye said. "So, a perfect rating, which is actually pretty much unheard of unless you are a very new partner." A perfect rating fit for a positive person— who doesn't let anything get in the way of living a fulfilling life. "There's many problems in the world, many problems in your life … but you can. You can," Jesus said.